Home Smartphones Samsung and HTC both show off smart-gloves. Samsung and HTC both show off smart-gloves. April Fools’ Day is here, and there’s no doubt that this day brings out the best from companies with a sense of humour. Samsung hit the hammer first, announcing its first ‘all-over-hand’ wearable device dubbed Samsung Fingers that features a flexible Super Emo-LED for the technology-sensitive consumer. HTC on the other hand teased its HTC GLUUV , which is also a smart-glove. The South Korean giant’s fictitious smart-glove features a 3-inch flexible UHD Super Emo-LED display; 16-megapixel camera; as well as gyro, barometer, compass, heart rate, proximity, thermometer, voice and gesture recognition sensors. The company notes that the Samsung Fingers supports 5G network and Wi-Fi 902.11wz connectivity options. Some preloaded apps in the wearable device include Finger Painter and S-tut, though the company did not humorously elaborate on what these apps can do. Further, the Samsung Fingers smart-glove comes with 4GB of RAM, and in 32GB/64GB inbuilt storage variants. Other features include Talk to the Hand, which can record and save a friend’s words while the Samsung Fingers user is busy with something else. 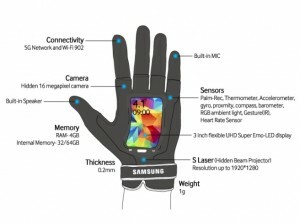 Samsung also notes that its first wearable glove (we haven’t heard of any glove that is not wearable!) sports an S Laser, which is a hidden beam projector and sports a full-HD resolution. Samsung has added two variants of the Samsung Fingers: Samsung Fingers Tough and Samsung Fingers Class. Some unique features included in the Samsung Fingers are S Charge, which offers charging via solar power by raising hand towards the sun; new controlled gestures for calls, and ThermoPad, which allows users to retain the temperature of products such as beverages. The Taiwanese manufacturer giant, following Samsung’s lead, also showed off its HTC’S smart Gluuv. Unlike Samsung Fingers however, which is highly imaginative, the HTC Gluuv design seems to be old school. The HTC Gluuv’s design appears more inspired from a Hollywood movie. The company notes that the HTC Gluuv is in beta, and can be integrated with company’s 2014 flagship smartphone, the ONE (M8). The wearable device from HTC features HTC-branded boom box dubbed HTC BoomBass, and an enormous 87.2-megapixel camera for selfies, as per HTC.